Citation: Hanna J. 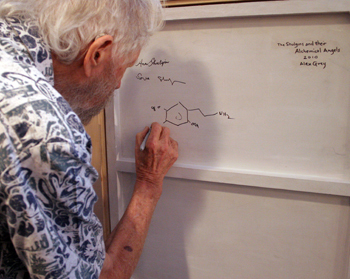 "Shulgin Appreciation at MAPS Con: Psychedelic Science in the 21st Century, April 15-18, 2010". Erowid.org. May 6, 2010. Erowid.org/general/conferences/conference_2010_ps21c_shulgin.shtml. The Shulgins and their Alchemical Angels. There is a lot to say about a conference as big as MAPS' Psychedelic Science in the 21st Century turned out to be. 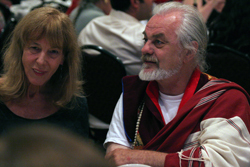 This brief article primarily describes Alexander and Ann Shulgin's participation, and the dinner held in their honor. The Psychedelic Science in the 21st Century conference was held in San Jose California in April 2010. 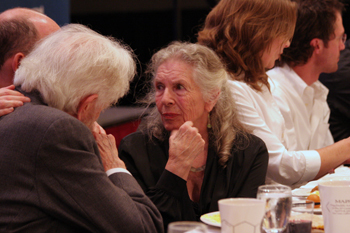 Along with more than 80 speakers presenting in three parallel tracks, there was also a tribute banquet organized for Alexander and Ann Shulgin, to honor their lifetimes' contributions to the field of psychedelic science. When planning our participation in the conference, it occurred to me that Erowid Center should sponsor a hospitality suite at the event, as a place where Erowid members could mingle during the off-hours for interesting discussions. We rented the largest suite available at the hotel for this purpose. 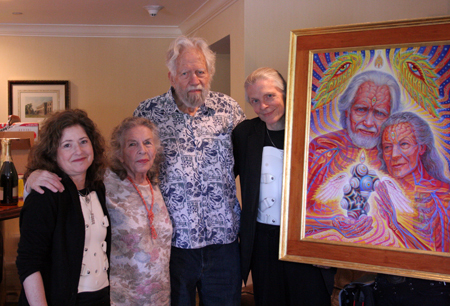 Prior to setting up the room on Thursday afternoon, we offered it as a space for Sasha, Ann, and Alex Grey to autograph the limited edition prints of Alex's newest painting The Shulgins and their Alchemical Angels. I had been amazed to learn that the Greys still planned to attend the conference following their seriously injurious car accident in mid-March and was surprised that Alex had been able to finish the painting in time for the event. The money raised from selling these prints will support both CoSM's building of an exhibition hall and MAPS' upcoming MDMA/PTSD study. The painting itself was to be revealed to the public for the first time on Saturday night, during the dinner honoring these psychedelic elders. Sasha draws a dirty picture of 2C-B. With Sasha and Ann seated at the large conference table signing sixty-five prints in succession, photographers circled, snapping photos and videotaping the proceedings. Everything went smoothly with the signing, and Alex asked Sasha and Ann to autograph the back of the original painting as well. This was what Albert Hofmann had done with Alex's portrait of him on his hundredth birthday, and Albert also sketched out the chemical structure of LSD. Recalling that detail, I proposed that Sasha draw a "dirty picture" of the 2C-B molecule. As Sasha's eyesight has been failing in recent years, his assistant Tania helped direct him by describing what position he was at on the ring structure; and despite having to draw at an awkward vertical angle, the goal was quickly accomplished. The Greys and the Shulgins. Post-signing, the continued marathon photo session made me marvel at the strength of the Grey's assistant, Eli Morgan, whose behind-the-painting-human-easel act allowed the photographers to snap away. I was excited on Saturday afternoon about going to the 4:30 showing of Dirty Pictures, a documentary film produced and directed by Etienne Sauret about the Shulgins. The movie was quite moving at points--particularly the second time that the DEA raid was shown, when cops forced the grandfatherly Sasha, handcuffed, into the back of a squad car. 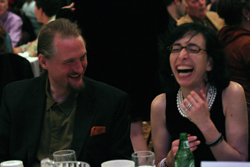 At dinner, Ann and Sasha listen intently to Ethan Nadelmann. We ask everyone to remember that this is a professional, scientific conference, and there will be many media representatives on site, seeking an answer to the question of what Psychedelic Science in the 21st Century looks like. [...] In case you are curious as to how to dress for this conference, MAPS' staff and associates plan to dress in either business formal or business casual attire during each day's proceedings, and those of us attending the Shulgin Tribute Dinner will be dressed in semi-formal evening attire. Fire in discussion with her dinner neighbor. Earth entertaining a neighbor at dinner. ...and I made a visit the Men's Warehouse prior to the conference. Indeed, I was surprised to see that at least one of the MAPS staff had decided to go entirely formal with his garb--tux and bow-tie--and my wife mistook him for a waiter during dinner! With the goal of "mainstreaming" psychedelics by dressing well, it is possible to take things too far. Earth and Fire and some others seated at the head table with the Shulgins dressed a little less formally than the suit-wearers. While many of the men at the head table wore suits or jackets and slacks, slightly less than half wore something differently formal, like nice button-up shirts, formal religious robes, black Utilikilts, or other dressy gear. Since "formal" mostly means "fancy" for women, all of the women were dressed appropriate to the MAPS guidelines. Perhaps the award for cutest outfits goes to the Greys for their matching white-plastic "turtle shell" body braces under black his-and-her suits. Overall, MAPS' dressing guidelines seemed to result in a media-appropriate smattering of weird, along with the formalwear. 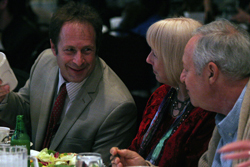 Rick Doblin chats over dinner with Nick Sand and another attendee. The room where Track 1 presentations happened during the daytime doubled as the space where the banquet was held; over 500 people were seated therein for the sold-out Shulgin dinner. Conference admission did not include a space at dinner, and anyone could purchase dinner tickets; this undoubtedly caused disappointment for some late-to-the-game conference attendees who were unable to score a meal ticket. Still, this was the largest dinner that I had ever been to. Although it was not an intimate affair, the giant projection screens showing the faces of those giving tribute to the Shulgins helped tremendously, and it was a treat to watch the during-dinner slide-show that featured photos of the Shulgins and their friends over the years. The meal itself was strangely inconsistent East Indian food, with a particularly disappointing dessert. Most of what I selected turned out to be forgettably bland. Yet others found the meal largely inedible, due to some dishes being too spicy hot. Indeed, one child at the head table appeared to be crying in reaction to the burn. Roland Griffiths and Bob Jesse. 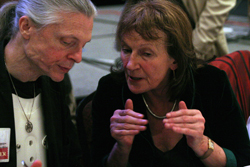 Alex Grey and Amanda Feilding. 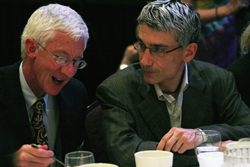 Over the course of the night, a dozen touching tributes were made to the Shulgins. MAPS' founder and conference producer Rick Doblin characterized himself as basically being a screw-up with stamina: he just kept trying. And his kind words about Sasha and Ann set the tone for all that followed, which included brief personal testimonials from an impressive list of current psychedelic luminaries. Loving, respectful homages were given by chemists David Nichols, Paul Daley, and Nick Sand, by researchers Charles Grob and Roland Griffiths, by drug policy experts Mark Kleiman and Ethan Nadelmann, by research coordinators Bob Jesse and Amanda Feilding, by the Shulgins' assistant and longtime friend Tania Manning, and by artists Alex and Allyson Grey. The chemists told stories of reading Sasha's early papers, like his landmark 1969 article in Nature "Structure--activity relationships of one-ring psychotomimetics" while in grad school and being inspired in their ambitions to become pharmacological chemists. Mark Kleiman, a UCLA professor specializing in drug policy, said that his life brought him into contact with a substantial number of people who were "famous" as the newspapers reckon things. He said that few of those were actually making history, and many of those few were in the room: Ann and Sasha most of all. 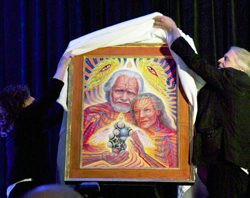 Allyson and Alex Grey unveiling. 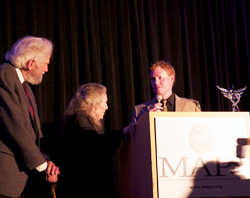 Shulgins, artist Logan MacSporran, and the "lifetime achievement award" (to the right). The Greys spoke while unveiling Alex's portrait of Sasha and Ann. (Alex was entirely loveable when he mentioned that this was his first-ever "unveiling", as he and Allyson dramatically pulled the draped cover from atop the painting.) Bob Jesse asked who in the audience related at all to Sasha and Ann as parental figures. Many hands were raised. With a passing mention of psychological "transference", Bob shared his view that Ann and Sasha are a uniting presence for much of our community, and he gave thanks for the parent-like comfort they've offered him in tough times and for their enthusiastic appreciations in good times. He also noted the courage that it took to publish PIHKAL, in light of foreknowledge that it was not unlikely to provoke government response. Bob Jesse's remarks about the Shulgins being like parents whom one could talk to about anything brought a tear to my eye, but it was Tania Manning's heartfelt closing remarks that pushed brine across brink. After the last speaker, a blown-glass "lifetime achievement award" was presented to the Shulgins by Rick Doblin and the artist Logan MacSporran, who had used some of Sasha's lab glassware as a source material in the caduceus-like figure. Sunday went by in a blink, and Monday morning (the 67th anniversary of the world's first intentional LSD trip by Albert Hofmann, aka "Bicycle Day") Earth, Fire, and I spent some time chatting with the Greys, who kindly traded one of the artist's prints of the Shulgin painting for one of the Visionary Synthesis prints featuring Michael Rauner's photographs of Sasha's lab. Alex's painting St. Albert and the LSD Revelation Revolution, The Shulgins and their Alchemical Angels, and Visionary Synthesis will all be hung in a special spot in the future Chapel of Sacred Mirrors, dedicated to the pioneers of the Entheogenic Reformation. 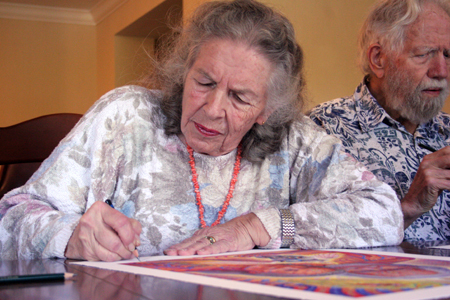 Alex mentioned the idea of possibly painting portraits of other noteworthy figures, such as María Sabina and Terence McKenna. Tania offered to send some "Shulgin relics" for CoSM's collection--perhaps locks of Sasha and Ann's hair, or old spectacles, or even a pair of Sasha's trademark sandals. We hugged each other farewell, simultaneously energized and exhausted from the weekend's incredible interactions. 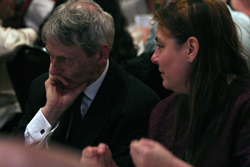 With over 1,100 people in attendance, the conference was a rousing success on multiple fronts. It was also a wonderful opportunity for those interested in psychedelic science to thank the Shulgins for their contributions. For more information on purchasing prints of The Shulgins and their Alchemical Angels, see www.maps.org. Proceeds benefit the Shulgins, MAPS' MDMA research, and the Chapel of Sacred Mirrors. v1.0 - May 6, 2010 - Published on Erowid.org, photos by Erowid.